Synthetic sports surfaces such as 3G artificial turf are becoming increasingly common in the UK as many schools and clubs have them installed to improve their existing natural sports facilities which may have become worn out and unsafe over time. The benefits of 3G are attractive to all kinds of organisations who want the playing qualities of natural grass for football and rugby, but don’t have the budget to carry out the heavy ongoing maintenance. Speak to our team of experts today for more advice and product information. We’d be happy to give you further details and offer a quote for any projects you may be looking to carry out. The specification for a 3G sports pitch is created using the highest quality artificial grass with the most advanced technology for football and rugby. A dynamic stone sub base made up of interlocking porous stones is installed onto the excavated ground to create a stable foundation for the surfacing to be laid onto, a layer of macadam will then be put down on top of the stones to make the area smooth. In most cases a shockpad will be installed onto the macadam base layer before the synthetic 3G grass is rolled out, this is to absorb impact during matches and training to prevent injury to players’ joints and muscles. Next, the 3G turf carpet itself will be installed in separate pieces which are joined together at the seams with glue. Sand and rubber infill is then put into the pile between the grass fibres to create natural performance qualities and to enhance the safety of the sports pitch. 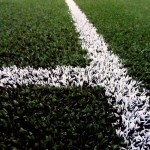 There are many benefits of 3G sports surfacing which make it a favourable option for a lot of schools and sports clubs in the UK who are struggling with the upkeep of a natural grass surface. Synthetic grass pitches require much less maintenance than natural surfaces as they don’t get muddy and worn out from heavy use and weathering. There is no need to mow the grass or apply pesticides so the only maintenance needed is drag brushing to redistribute the infill, as well as preventative moss and algae treatments to stop contamination. 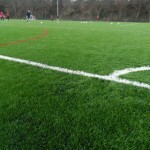 3G artificial turf is an extremely durable all weather surface type which does not get damaged easily, its porous layers mean that water can drain away quickly and therefore training and matches do not need to be called off in wet weather. A consistent, good quality, safe playing experience is achieved by the advanced technology of artificial grass and the shockpad underlay which is installed to cushion joints and combat injuries. There are considerable financial benefits of 3G pitches to a club or school as the versatile surfacing can be rented out for training and matches by other organisations during the evening and when the facility is not otherwise in use. This provides an excellent return on investment and can help to pull struggling clubs out of financial difficulty. A new top quality sports facility can help bring people together from all corners of a community to promote sport and healthy living with people of all ages and abilities. The benefits of 3G synthetic turf sports pitches are clearly outlined here and the positive effects that these top quality facilities can have on struggling clubs are seen throughout the UK. We have installed numerous third generation synthetic sports pitches and multi use games at various organisations and locations and we would be happy to discuss any questions or enquiries you have in regards to this type of facility. Please head over to our website at https://www.sportsandsafetysurfaces.co.uk/ to look at examples of our previous work and the other services we carry out for a range of sports surfaces. Use our contact form to send us over the details of your project and a member of our team will get back to you to advise you on prices and specifications for your chosen sports facility.